College of Optometry students hang out in the student lounge, dubbed “the pupil place” by popular vote. Back row from left: Nick Palisch, director of student and alumni services; Jessica Weiss; Taylor Wolkart; Aric Waltz; Stephen Wells. Seated on bench from front: Alaina Altenbernd, Matt Falconer, Jialin Su, Torvín Rajala. Seated opposite bench from front: Elizabeth Voss, Jasmin Welch, Kaleigh Albers, Meghan Guinotte. Front table from left: Conor Haugen, Brad Cary, Janessa Visin. Back table from left: Kyle Carnahan, Molly Huck, Meagan Anderson. Standing at right: Janice White, interactive graphic designer. (Photos by August Jennewein). 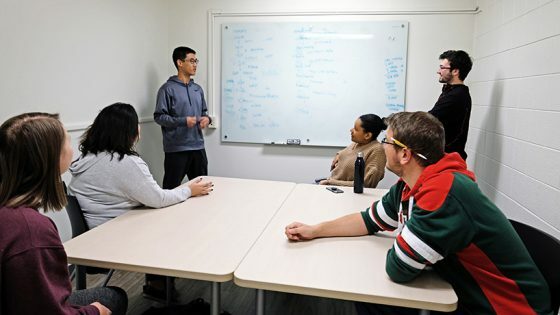 Anyone who has come into contact with optometry students know they love a play on words, which is why the recent Marillac Hall updates began with a pun versus pun situation. Both were student-generated submissions to name the University of Missouri–St. Louis College of Optometry’s student lounge and main gathering area. Christening it was the jumping-off point for a makeover to address student success and to enhance new student recruitment. In the end, “the focal point” won out. 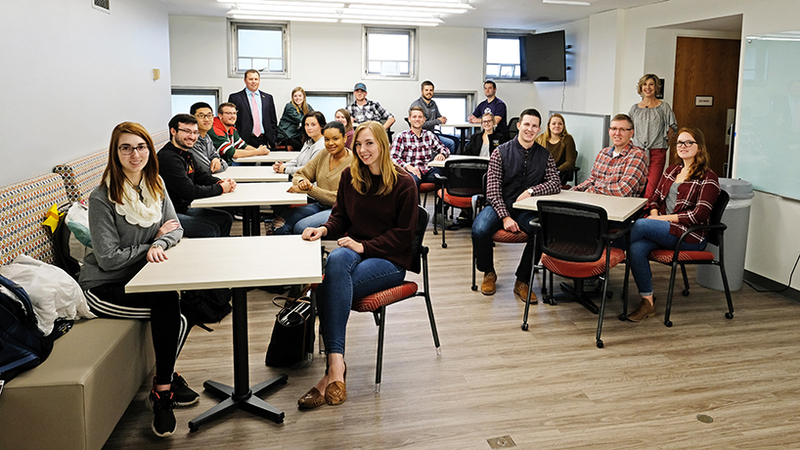 Last fall, students approached Nick Palisch, director of student and alumni services, because they needed more study spaces, and anyone who has come into contact with Palisch knows he takes students’ needs seriously. The student design committee made sure the update included plenty of hard-top study spaces. From left: Taylor Wolkart, Kaligh Albers, Molly Huck, Meagan Anderson. Which is how, less than a year later, four floors of optometry space in Marillac Hall have been updated to both refresh existing study spaces and create new ones in the college. The second floor, which previously housed the pediatric exam rooms and now is student practice space, was renovated with new floors, paint and lighting; to expand the number of practice lanes from 11 to 22 and to include new technology, such as digital acuity charts. With 23 optometry schools competing for a relatively unchanging pool of incoming students, Marillac’s makeover will help UMSL contend. Alaina Altenbernd (left) and Elizabeth Voss (right) test out one of the cozy study spaces in Marillac Hall. To put together the most effective spaces, Palisch decided to form a renovation-design student committee and put out a call to frequent on-campus studiers. 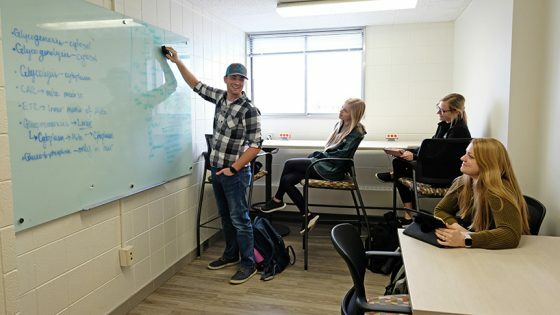 Aside from himself and Interactive Graphic Designer Janice White, the committee comprised second-year students Megan Anderson, Matt Martinez, Janessa Visin and Taylor Wolkart as well as third-year students Krystal Matson and Aric Waltz. They got down to the work of design, looking for unused areas and nooks in Marillac that could become study spaces and then figuring out what elements should be included. The group visited three furniture vendors and selected Modern Business Interiors in St. Charles, Missouri. 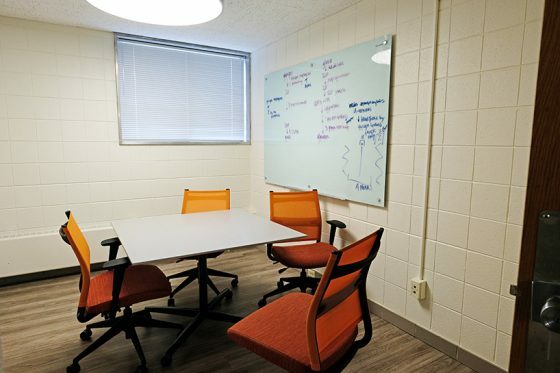 The larger study spaces and new whiteboards allow students to collaborate in their learning. Standing in back: Jialin Su (left) and Matt Falconer (right). Seated at table, clockwise, Jasmin Welch, Torvin Rajala, Meghan Guinotte, Kaligh Albers. The group considered what Matson calls the “functional” aesthetics of the spaces: hard study spaces versus soft lounging areas, table height and shape as well as appropriate dimmable lighting for testing color vision and acuity. Then White put together fabric swatches, focusing on creating pop with bright colors. Even after all the optometry students have, at last, gone home, traces of their presence remain in the form of notes and filled trashcans. The contractors finished on time, and the incoming class was pleasantly shocked by Marillac’s transformation, which doubled the amount of study areas. 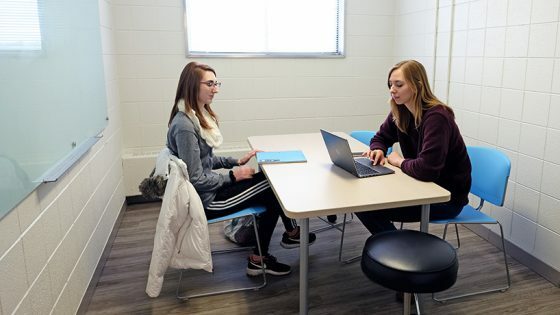 Some of the new spaces – like first-floor study areas designed like restaurant booths – have become so popular that students claim them as early as 4 in the morning. Plus, the soft chairs for catnaps, microwaves and water fountain ensure a comfortable all-day space, which comes in especially handy for third-year students preparing for boards.